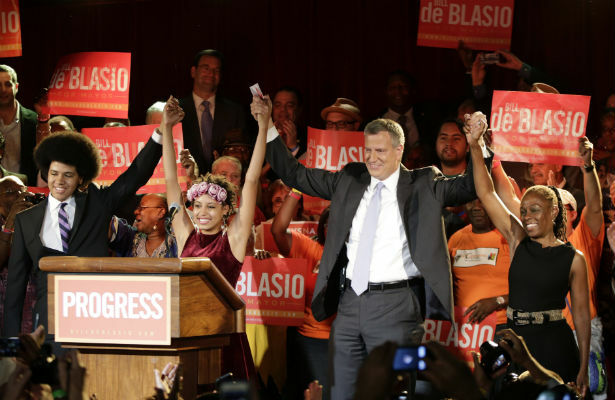 Why his campaign for NYC mayor has ignited the passion of New York’s progressives. “Unapologetically progressive”—two words spoken all too rarely by triumphant candidates in major electoral contests these days—were among the first pronounced by Bill de Blasio as he celebrated his inspiring win in the first round of New York City’s Democratic mayoral primary on September 10. At this writing, a runoff with rival Democrat Bill Thompson is still possible, though the moderate, affable African-American former comptroller trailed the liberal public advocate from Park Slope—whom this magazine endorsed—by 14 points (losing by an even larger margin in black-majority districts). Running a distant third was City Council Speaker Christine Quinn, a practiced political player who tied her fortunes to that of the city’s billionaire mayor, Michael Bloomberg. And indeed, while Bloomberg’s name was not on the ballot, his shadow loomed over the race. De Blasio won, disputatious New Yorkers generally agree, because of his campaign’s relentless focus on the two most glaring failures of Bloomberg’s tenure: the rise of the racist police profiling practice known as stop-and-frisk, and the explosion of income inequality. While the former is blatantly unconstitutional and has made daily life a maddening trial for the city’s majority-minority residents, the latter has produced a “Gilded City,” as we wrote in these pages last spring—one where 50,000 people sleep in homeless shelters or on the streets each night, and where nearly one in two New Yorkers is poor or near-poor, even as the richest neighborhoods revel in a record-breaking increase in wealth. Yes, these income trends mirror national dynamics, but they are worse in New York. And if there was any doubt about where the mayor’s sympathies lie, he dispelled it in his now notorious fit of pique about de Blasio’s “class warfare” campaign, in New York magazine. What is “class warfare”? It is asking those earning more than a half-million dollars a year to pay half of one percentage point more in taxes to cover the costs of universal pre-kindergarten— about $40 per week for those earning a million a year. National progressives can take heart that this message of economic liberalism proved so resonant at the polls for de Blasio. But this is precisely what the business establishment finds “terrifying,” in the word of a brave anonymous banker quoted in The New York Times. Forthwith, the bankers and developers, and their charity-circuit friends, began desperately to rally around the Republican nominee for mayor, former transportation executive Joe Lhota, the stop-and-frisk enthusiast who will try to sell himself to New York voters by fanning fears of a return to Dinkins-era crime and economic malaise. Our guess is, voters will not be buying. The myth that responsible municipal management means busting unions, harassing minorities and privileging the already ultra-privileged has itself been busted. Not just de Blasio, but a whole slate of unapologetic progressives who won down-ballot races September 10 have shown that old-fashioned liberalism is making a long-awaited comeback in famously liberal New York.